On any jobsite, two height-related hazards are ladders and scaffolds. Scaffold safety is paramount. As important as it is to stay safe, protect yourself from the multitude of jobsite hazards, include falling off a scaffold. 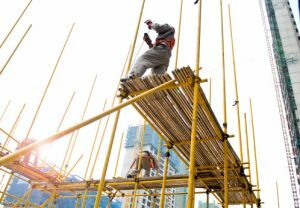 In this blog, we will review the importance of scaffold safety. How can you stay safe when you’re working up there? Read on to find out more! There are no guardrails on the scaffold. Wooden planks are broken or planking cover is insufficient. The access point to the scaffold is unsafe. The cross bracing on the scaffold is insufficient. The scaffolds have been bridged. Don’t work on scaffolds when the weather is stormy or windy. Make sure the scaffold has been fully planked and can support you. Jumping from scaffold to scaffold is inadvisable. Resist the temptation to throw items over the sides of the scaffold. This is dangerous unless you have someone at ground level to act as a spotter and can catch the items you are throwing down. Equip safety belts and other types of available harnesses. Slow down your pace or or opt for alternatives measures to maintain efficiency. Efficiency should never come at the expense of your own safety or the safety of your coworkers. Organize your entire workspace or workplace. Avoiding minor slipping, tripping, or falling hazards is simple. Just keep your workspace or workplace organized. Keep your tools organized as well, to prevent them from falling off the sides of the scaffold. Of course, identify any related hazards. Any hazards or solutions for them should be considered and dealt with before beginning work. Ensure proper training. Make sure that you and your coworkers have the proper training and know what to do in the event of an accident or other emergency, especially with OSHA standards a critical consideration. Always review the safety of the worksite. Again, maintaining OSHA standards is critical.Preemptively identify hazards that might emerge once work begins. Account for possible worker neglect as comfort levels increase over time spent working on the site. This entry was posted on Tuesday, April 4th, 2017	at 2:10 pm	. Both comments and pings are currently closed.